The enchanted world of Pogles Wood was a wondrous world, full of adventures and happy times for the Pogles. Amos Pogle was a skilled craftsman, clever wth his hands, able to make things for Pippin and Tog to play with, which included walking stilts. Edna Pogle, constantly referred to as, 'wife' by Amos liked to bake and weave cloth and was always asking her husband to pick blackberries for her. 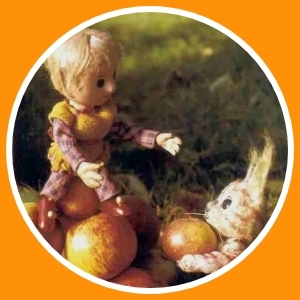 Pippin was found as a baby by Amos Pogle in flower petals, and is believed to be the son of the King of the Fairies. Tog was a stuffed toy brought to life to defeat the bad witch and has been kept alive forever. These are, The Pogles who are awaken each morning by the Hedgepig, who rings the front door bell as he goes to slumber, after his nocturnal feeding. Pogles Wood was a particular favourite for me. It was just ten minutes of captivating stories with excellent animation and great voices. 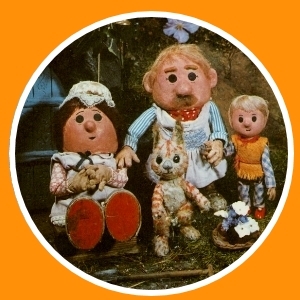 Made from 1965 to 1968 by Smallfilms, with Oliver Postgate the voice of Amos Pogle. And there was some fantastic yearly annuals with great stories and features. Pogles Wood also appeared in the comic, Pippin. Now out on DVD. Go on, go down that memory lane....it's brill tele!